USPA 2013 Nationals Skydive Chicago. 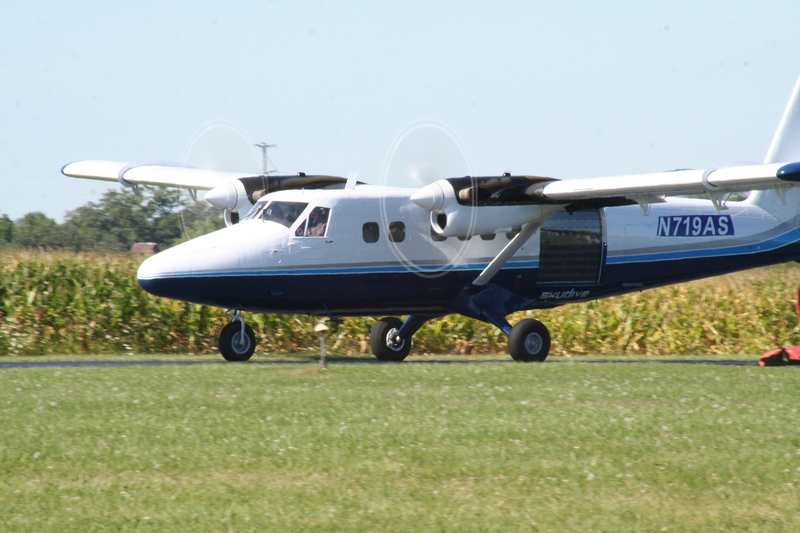 The Twin Otter is probably the most versatile jump aircraft in the turbine world. It’s a fixed gear aircraft with predictable flying characteristics. This makes it one of the safest aircraft for new turbine pilot flying skydivers. You will find most Twin Otters used for skydiving are of the “Super Otter” variety. This means they have the Pratt and Whitney PT6A-27 engines. The airframe itself may be a -100, -200, or -300. The 300 series came with -27s as standard. Several 100 and 200 series airframes have been converted to the -27 engines. Check with your aircraft’s AFM for specific operating limitations on the engines. Some aircraft are limited to how much torque (Tq) they can pull for take-off due to airframe limitations. The trick to flying Twin Otters with jumpers is that you always take-off heavy and land empty. Landing empty and having a heavy crosswind can be very tricky. The Otter pilot really needs three hands in this situation. Cross wind technique cannot be stressed enough. Sideslip into the crosswind and with one wheel down pull the engines into as much Beta as you can and let go. Transfer the right hand to the yoke and roll the ailerons into the wind. Even light crosswinds (5-10 knots) will require full aileron deflection in the end. Once the right hand is on the yoke then the left can grab the tiller bar for nose wheel steering. With good crosswind technique the pilot should be able to run the aircraft down the runway as though the tiller bar was not even there until it is necessary to turn off the runway. Pilot Induced Oscillations (PIOs) with the nose steering are very common in new Twin Otter pilots. I haven’t spoken to a one of them that hasn’t been there once or twice. It can be a hard transfer from aircraft that steer the nose with the rudder pedals to one that only has nose steering with a “Tiller Bar”. After take-off, if the pilot does not center the tiller (putting the nose fork into the notch) then it can drift full deflection to one side or the other. If it is not caught before landing your “fixed gear” aircraft will have a gear up landing. And who knows what else you will bend in the process. Climbing in the Twin Otter can really blow you away in the beginning. Coming from light single and twin-engine aircraft it’s quite a change. Four years after checking out in the Twin Otter I’m still impressed with how short the take off run is and how stable it is at slow speeds. Warning! The Twin Otter will fly well below Red Line Vmc! Be Careful not to get airborne before Red Line Vmc. Another area where pilots mess up is that they climb at the wrong airspeed for Best Rate Vy. In the old PT6A-20 Otters the Vy speed is 87 KIAS. But with the –27s Super Otters it is listed at 100 KIAS. My conjecture on this change is that the engines put out more thrust with some ram effect at 100 KIAS. The wing is the same on both aircraft. Only the engines are different. Personally, I use between 90-95 knots for the initial climb and end up at 90 knots by the time I’m at 14k. The proof is in the turn time. It’s not how you descend after the last jumper is out that changes your turn time. It’s all in the climb. Another consideration for new turbine pilots is that they now have the capability of going to some very high altitudes. BE CAREFUL ABOUT OXYGEN! You’re not used to this yet and you will get tired going to 14k all day long. It will affect your judgment. Don’t be a statistic. When you get cranking and used to the altitude then you can bang out 42 loads in one day like Mark Lamberson. It’s the most loads to full altitude in one day during daylight hours that I know of in Twin Otters. I’ve done 37 and it hurts at the end of the day. Know your limits. Typically jump run can be flown at an indicated airspeed of 80 knots. Higher airspeeds will be needed with more “floaters” on the outside and more weight placed in the tail. 95 knots is a good airspeed for floating more than seven jumpers outside. As stable as Otters are, they can stall on jump run. The results can be a collision with a floating jumper and the horizontal stabilizer. In one incident a jumper was caught square on his backpack and drug down three thousand feet before rolling off. Not a fun place to be. At 13,000 feet and indicating 85–90 knots your True Airspeed (TAS) will be about 100-105. So, if your ground speed is 100-105 you know that you don’t have any wind on the nose. This can be useful in determining any last minute adjustments to freefall drift corrections. Depending on how big the groups are will affect the flight characteristics. Large groups will have a large shift in CG to the aft. I recommend that you DO NOT trim the aircraft nose down during jump run to take away the pitch up force. Moving the trim tab towards nose down will decrease the effective length of the elevator. Just muscle the force. It’s what you’re getting paid to do, right? Plus, when they leave, you won’t have to muscle the elevator the other direction towards you. This will keep a steady floor for the final divers and they won’t get pinned to the floor or smack the door frame while running out. If you have many small groups the CG shift will not be as great but the jump run length will really string out. As you get lighter you will be able to fly slower with no problem thus reducing your groundspeed especially during the downwind leg of a hook pattern jump run. Refer to the spotting section to learn more on how this is useful. Jump run power settings are typically 20 lbs. Tq. I give a cut on the left engine to about 10 lbs. or a little less. With large groups climbing out I will leave both engines at 20 lbs. Tq. Airspeed will be about 80 knots indicated. Having the engines at these power settings will also help during the hook pattern jump run. Just let the right engine drag you around in the turn. It is an uncoordinated turn but it will be more desirable for the jumpers instead of a heavy banking floor. When you’re ready to roll out just put in rudder. Takes practice, but works great. Warning! Modern day jumpers have discovered that some Otters have extra handles on the roof for larger groups to float out. They will use these to climb on the roof and slide back to the tail. Doing this can cause airflow disruptions on the horizontal stabilizer and if they have a premature deployment it could very likely take out the tail. Remember, you do not have to wear an emergency bail out rig while flying Twin Otters. A crash of a Cessna Caravan was caused by a premature deployment over the tail (the jumper was NOT on top of the tail). It ripped the tail off, killed the jumper, and the pilot was finally able to bail out at an estimated 500 feet AGL! In the world of aviation the name of the game is PREVENTION. Before letting jumpers use your aircraft as their personal jungle gym think it through as to the consequences. Hang on to your hats cause we’re going for a ride! Probably the most fun for observers and the most tiring aspect of flying jumpers is the descent. The Twin Otter was not certified to do barrel rolls after the last jumper leaves so don’t do it. Just nose over and start a turn if you need to. Just remember that you may feel only two Gs in your seat but the engines are outboard a ways and may be experiencing a lot more stress with your banking and yanking. Those PT6s are running in the neighborhood of 25-30,000 RPM with tight tolerances. Be kind to them. Lastly, PROCEDURES, PROCEDURES, PROCEDURES!! Know your procedures for all emergencies and malfunctions. Use a checklist. If you can’t handle knowing this aircraft inside and out then you don’t belong in it. It’s a relatively simple and docile aircraft but if you don’t know your procedures then this aircraft will bite you. Use proper crosswind correction for all take-offs and landings. It’s got a big tail and will weather-vane easily when empty. This narrative was written by a knowledgeable pilot with many years of jump pilot experience and many, many hours in type. It is not intended to teach you how to fly this aircraft in initial checkout, but rather to give you direction for how to fly this aircraft with skydivers.